1.) 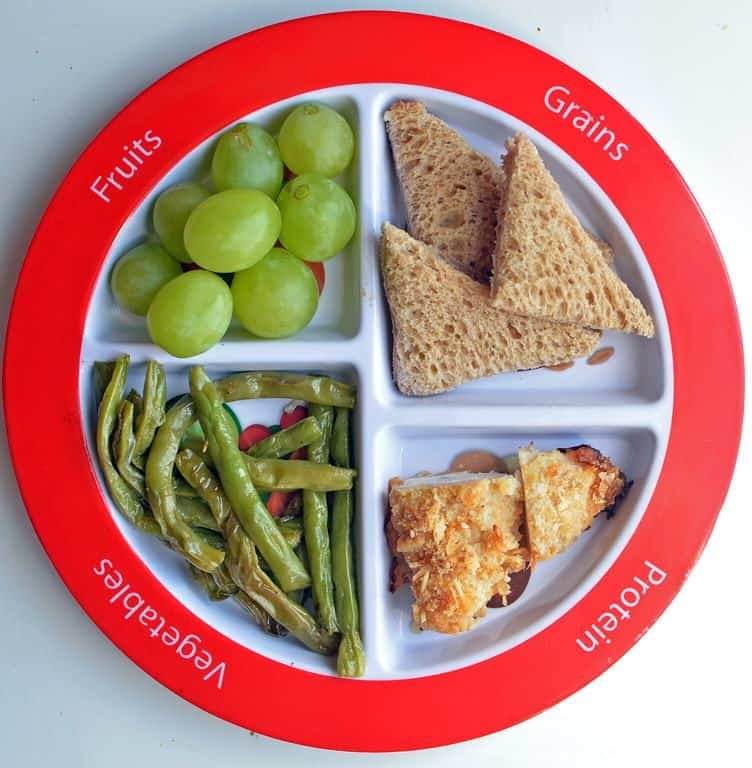 Make half your plate fruits and vegetables: Choose red, orange, and dark-green vegetables like tomatoes, sweet potatoes, and broccoli, along with other vegetables for your meals. Add fruit to meals as part of main or side dishes or as dessert. The more colorful you make your plate, the more likely you are to get the vitamins, minerals, and fiber your body needs to be healthy. 3.) Switch to fat-free or low-fat (1%) milk: Both have the same amount of calcium and other essential nutrients as whole milk, but fewer calories and less saturated fat. 4.) Choose a variety of lean protein foods: Meat, poultry, seafood, dry beans or peas, eggs, nuts, and seeds are considered part of the protein foods group. Select leaner cuts of ground beef (where the label says 90% lean or higher), turkey breast, or chicken breast. 6.) Drink water instead of sugary drinks: Cut calories by drinking water or unsweetened beverages. Soda, energy drinks, and sports drinks are a major source of added sugar and calories in American diets. Try adding a slice of lemon, lime, or watermelon or a splash of 100% juice to your glass of water if you want some flavor. 7.) Eat some seafood: Seafood includes fish (such as salmon, tuna, and trout) and shellfish (such as crab, mussels, and oysters). Seafood has protein, minerals, and omega-3 fatty acids (heart-healthy fat). Adults should try to eat at least eight ounces a week of a variety of seafood. Children can eat smaller amounts of seafood, too. 8.) Cut back on solid fats: Eat fewer foods that contain solid fats. The major sources for Americans are cakes, cookies, and other desserts (often made with butter, margarine, or shortening); pizza; processed and fatty meats (e.g., sausages, hot dogs, bacon, ribs); and ice cream.